"Deep in the heart of nowhere, near a place called Abbey Marston, there’s a caravan site. The perfect place to get away from it all. Close by, there’s a stone circle they used for human sacrifice in olden times. A little further afield, there’s an old RAF research station, where they did hushhush things in the War. No-one wants to hear the ghosts." You can tell that Big Finish have a lot of good will behind this one. For months now, all we’ve heard about with regards to the ‘Main Range’ is that Static is on its way, and it’s scary, thrilling, chilling and not to be missed. Some are even saying it’s better than The Chimes of Midnight. You wouldn’t think as whole trilogy of Sixth Doctor, Flip and Constance plays had been released, only this one. Is it any good though? Yes! The Doctor and his friends land on a creepy campsite, to the disappointment of his companions who both want to go home (is it just me or does that come from seemingly out of nowhere? Even the actors sound a little confused in the extras on this point). The site is creepy, wet and a place where portable televisions, radios and cassette recorders are not allowed. Oh, and ghosts abound. It’s a good set-up milked for all it’s worth by Jonathan Morris, with some good, meaty drama for the guest cast to get into. As with last month’s The Middle, the opening episode is very strong and arguably the best of the four. The sound design by Joe Kraemer and Josh Arakelian are the real stars of the show here, sweeping hiss and crackle and rain around us after a rather bizarre spoken introduction by Nicholas Briggs letting us know it’s a Big Finish play we’re listening to (or at least, that happened on my download. I can’t speak for the physical releases). The music is less good though, at times being pretty intrusive: you notice it because it doesn’t quite fit. Now, most soundtracks for Big Finish do not really evoke the eras the stories are set in, sounding like... well, Big Finish soundtracks instead, but that’s fine. The actors don’t sound as they once did either, so you let it pass. Here though, it fails to either evoke the Colin Baker era or be its own Big Finish thing, standing somewhere between the two and falling short at both ends. That’s okay though because the atmosphere in performance and dialogue is more than enough to make up for it. I could niggle and point out the fact it’s steeped in cliché, but that’s rather the point at the start and by the time it’s become its own thing, it has carefully let you know its genre and made you comfortable in the surroundings. The final episode arguably is a bit too signposted with its beats and could benefit from a bit more focus on reactions from the supporting cast and regular crew (the Doctor feels especially cold at times and gets away with it, which feels a wasted opportunity), but again, everything else is working hard to make up for it. This is Jamie Anderson’s finest hour as director, and his casting here is brilliant with every supporting character being perfectly chosen. David Graham is as good as you would expect, but Scott Chambers, Pippa Nixon and Jo Woodcock are all equally impressive and names to watch out for. 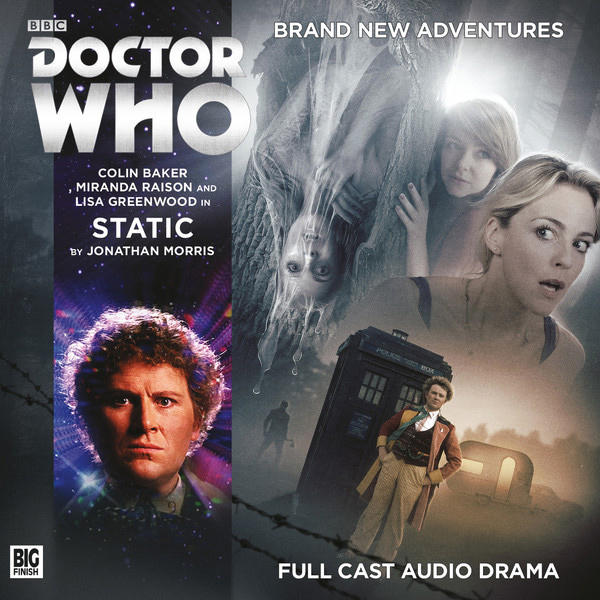 It’s a pity that, as is always the case seemingly nowadays, the extended extras for subscribers are (inexplicably) not available from the off as the interviews we do get seem to jump around and Colin Baker especially, is very enthusiastic about the play. It would have been nice to hear his and the other cast’s full thoughts instead of the rather obviously edited highlights. It’s been a long-term grumble of mine that Big Finish run their writers dry, leading to far lesser productions than the writers would give us otherwise, and I stand by that still. Keep using the same shirt and it’ll run ragged in the end. A play like Static only ups this feeling in my mind. Morris is a brilliant writer and this is a brilliant script, and with a bit less elsewhere, you feel that other writers of his ilk could hit these high spots time and again instead of increasingly fleetingly. Is it the Chimes of Midnight beater, others are claiming it to be? No, frankly, but then again they’re two very different plays so it’s an utterly silly and redundant comparison. Static is its own thing, and it’s bloody good. No wonder Big Finish have been celebrating it loudly. It’s worth every shout.